Hey guys, I'm looking for riding buddies in and around the Pittsburgh area. Riding areas are getting thin. Where ever you ride I'm in. Well your kinda of east coast so I will be nice and share a PA spot with you. Plus it is in your state! I think they say it is 27,000 acres!! I live about 1 hour away from Pitt. Around here we got Dirt Soldiers, "Murf", Rock Run. They're all nice for right now Rock Run is only havin poker runs to get money saved up to actually open full time next year. Write back, I'm always up for being a tour guide. been itching to go riding lately, last riding i did was at Dirt soldiers about a month ago, scoob and co did a great job with the track btw. need to find myself a decent truck to haul the bikes around! 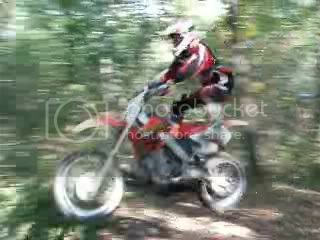 Is anyone going to Rocket Raceway for the Hare Scramble this weekend on Sunday the 29th??? I live in Western Pa and know alot of great riding spots. When are you going riding next?? If it is possible, it is done. If it is impossible, it will be done. slippery Rock Dunes is bad, it is not maintained but if you go just down the road you will find another track called Switchback Raceway which is very nice it has multiple tracks that range from Supercross to Harescramble type courses.